I love Stuffed Baked Potatoes. I have ever since I first tasted this recipe in 1980. 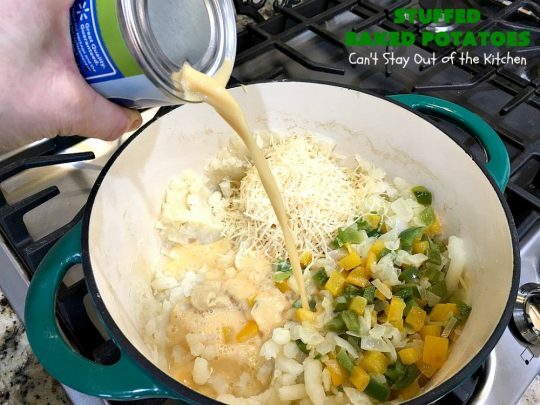 It’s a rather simple recipe using baking potatoes, Maine potatoes, evaporated milk, bell peppers, onions, Grey Poupon mustard, tabasco sauce and both parmesan and cheddar cheeses. 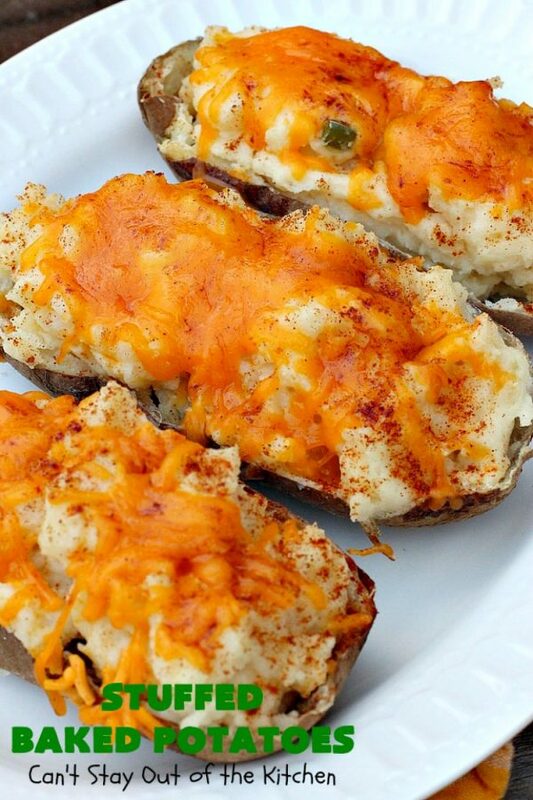 It’s sprinkled with paprika on top before baking which provides a nice additional touch of flavoring. These potatoes are tasty, elegant and perfect for company dinners. 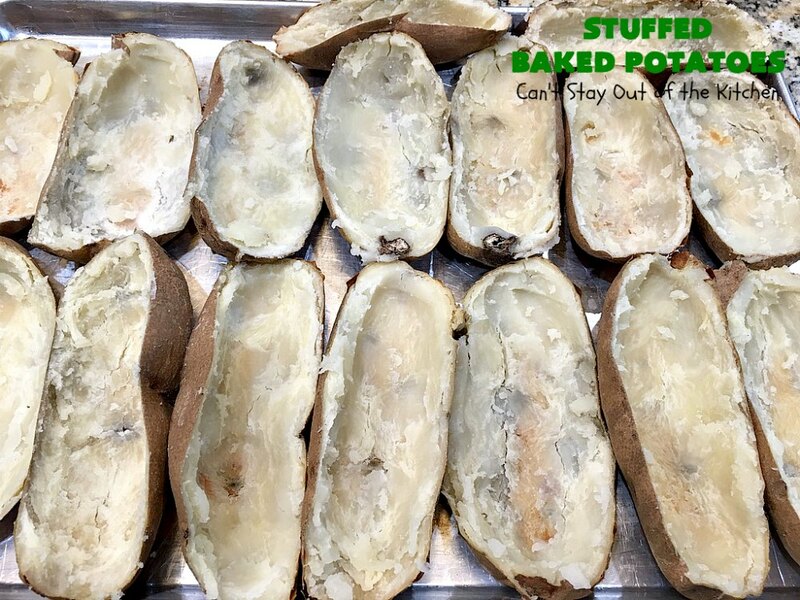 I served these potatoes for a Friday night care group in January. I served them with my favorite Texas BBQ Ribs recipe. Both were absolutely mouthwatering. Neither were low in calories but they were big on taste. Because I made so many potatoes, I had them for lunches several days afterwards. Back in 1980, our church cook made this for a special church banquet. 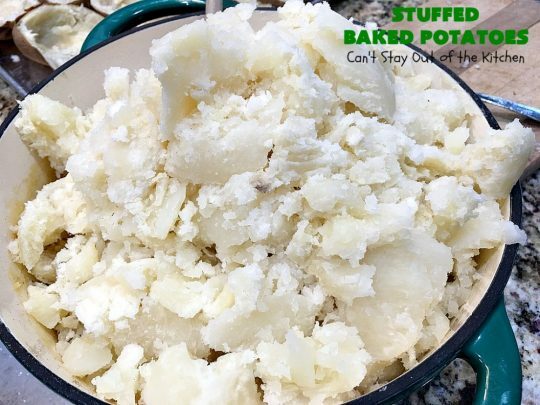 I thought the potatoes were so good I asked her to make them for a Deacon and Wives Banquet I was coordinating. I collected several recipes from Pat that weekend. They included one for Sugar Cookies, Creamy Italian Dressing and coffeecakes that she made with assorted jellies or pie fillings. She was a fantastic cook who was employed full time by the Pinellas County School System in the Largo/Seminole area of Florida. Because our church grew so large, she became the full-time church cook in the early to mid 1980s. We loved Pat Whitfield’s cooking. She was such a happy person to be around. No matter how busy she was in the kitchen, she always had a smile and never got shook over any disasters! I didn’t really know much about cooking at the time, so I was grateful to receive many of Pat’s recipes. It never ceased to amaze me how she could plan and prepare meals for thousands of people like she did. Granted, she had kitchen helpers, but still. Cooking on that scale is a LOT of work! 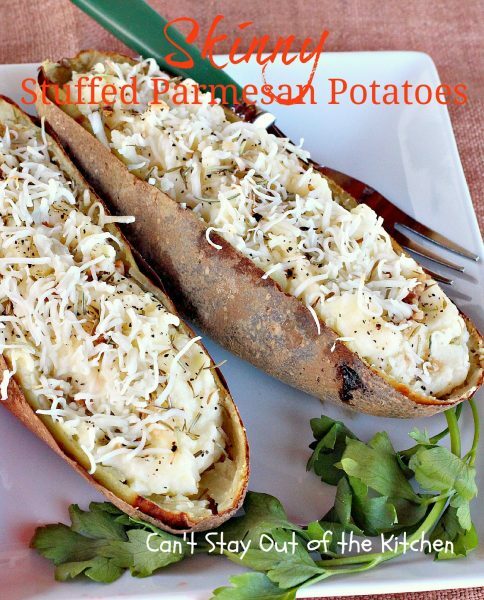 This recipe has a lot of cheese, but it does not have bacon. 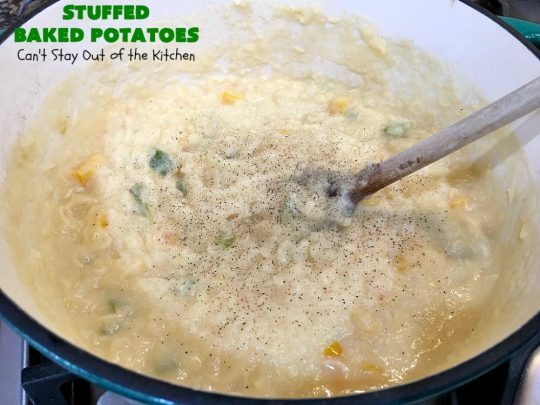 I specifically did not add it to this recipe so I could stay closer to Pat’s original recipe. You can add bacon if you prefer, but I want to devote another post to that sort of recipe. Stuffed Baked Potatoes is more of a vintage recipe. 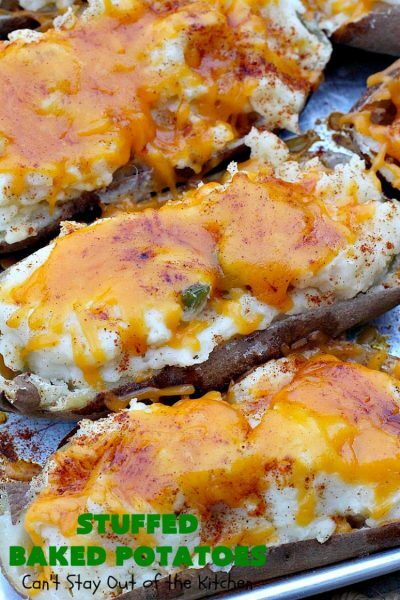 It was around long before loaded bacon and cheese became the gold standard for potatoes and soups. It’s a delightful recipe that we still enjoy to this day. 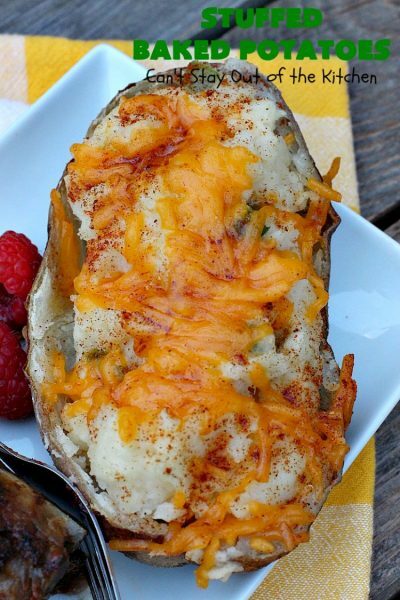 Stuffed Baked Potatoes are so delicious. 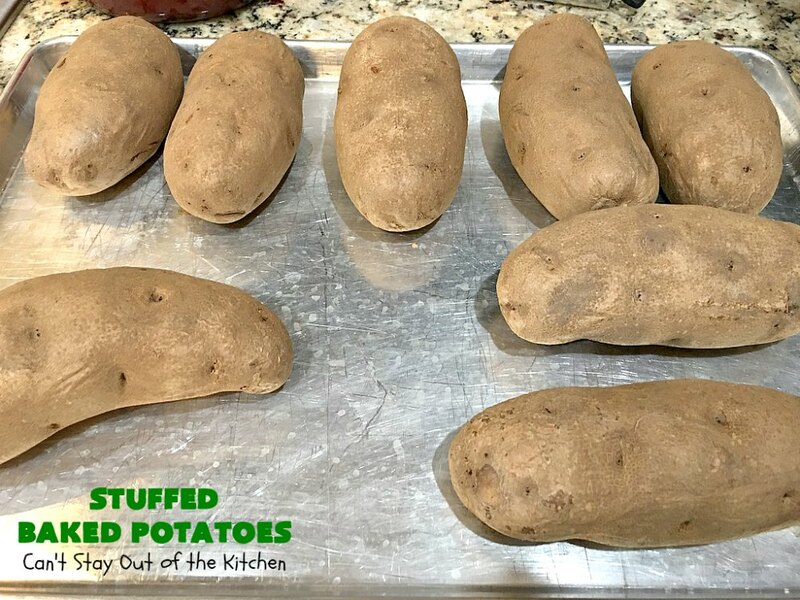 These potatoes are huge. They can easily become a meal in themselves if you wanted to eat them for Meatless Mondays. 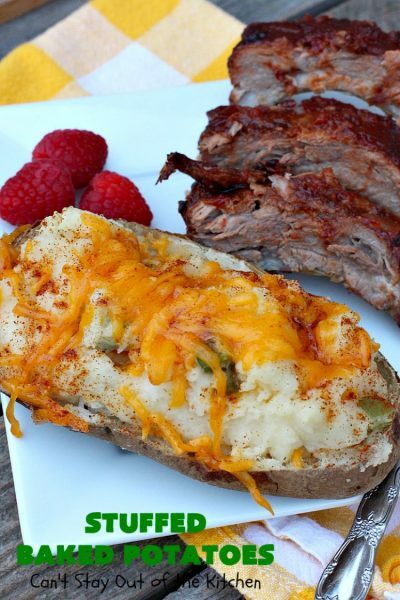 I served Stuffed Baked Potatoes with Texas BBQ Ribs. That meal was finger lickin’ good! 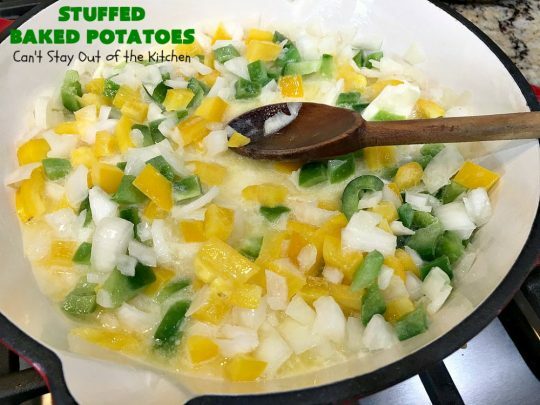 Place butter, bell peppers and onions in a large skillet over low to medium heat. 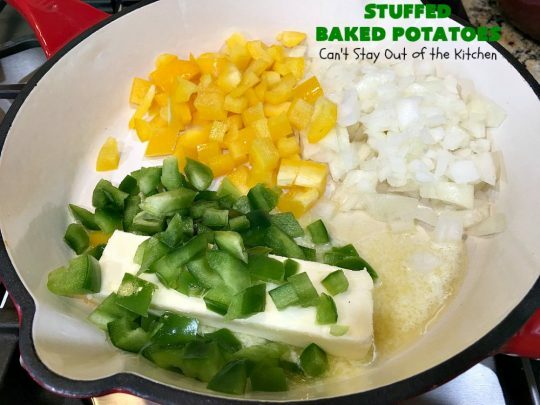 Saute bell pepper and onion in butter until tender. Meanwhile, boil the Maine potatoes. 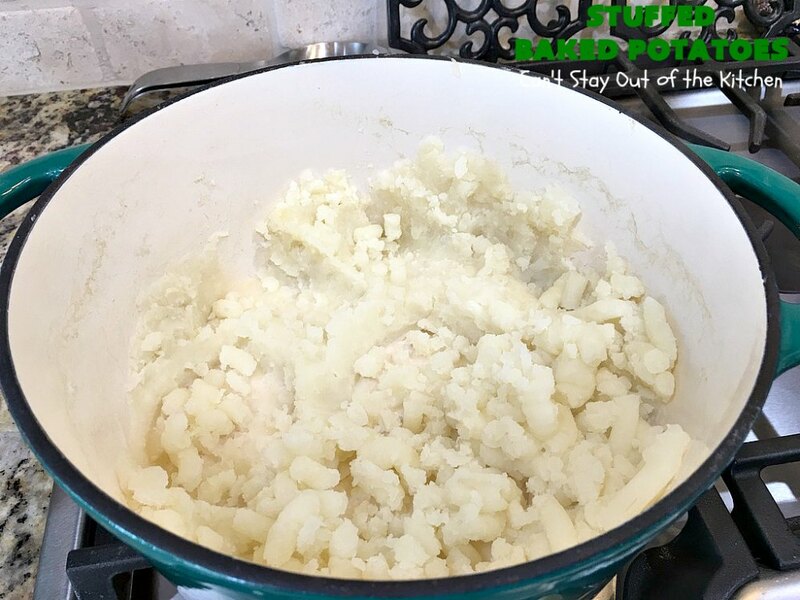 Drain; mash potatoes with a potato masher. Here the Maine potatoes are mashed. To the Maine potatoes in Dutch oven, add sauteed veggies, parmesan cheese, Tabasco sauce, Grey Poupon mustard and evaporated milk. Stir to combine. Season mixture with salt and pepper. Stir again. 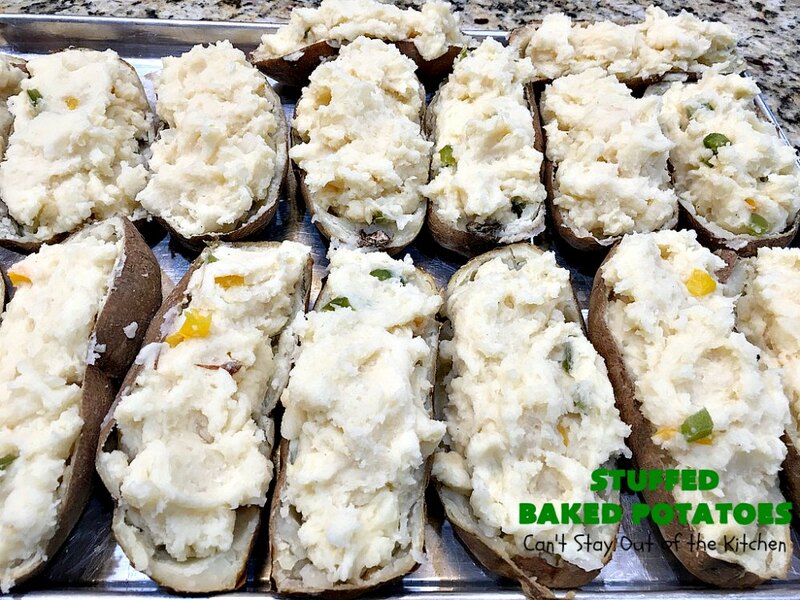 Meanwhile, bake large baking potatoes in 400 degree oven until done. This will probably take about 1 1/2 hours. Scoop out potato pulp carefully. Leave about a 1/4-inch border around the outside edge of the potato so the shell stays firm. Place potato halves on a large cookie sheet. 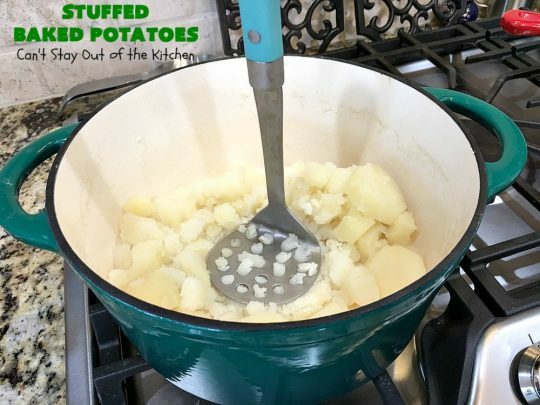 Add potato pulp to the other potatoes in the Dutch oven. 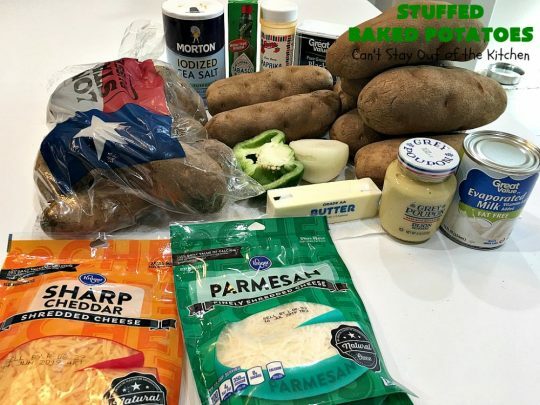 Stir ingredients really well to combine. Check seasonings. Add more salt, pepper, Tabasco sauce or Grey Poupon mustard if your taste buds require it! 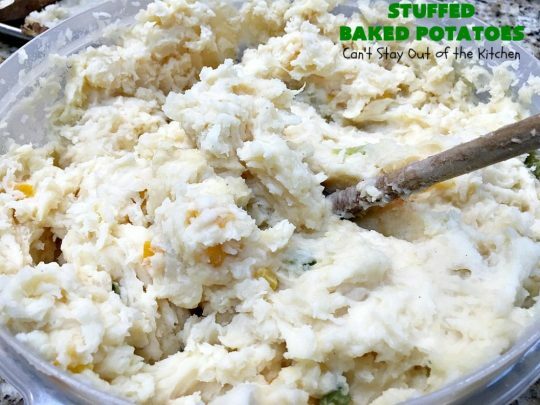 Stuff potato shells with mashed potato mixture. Top with shredded cheddar cheese. 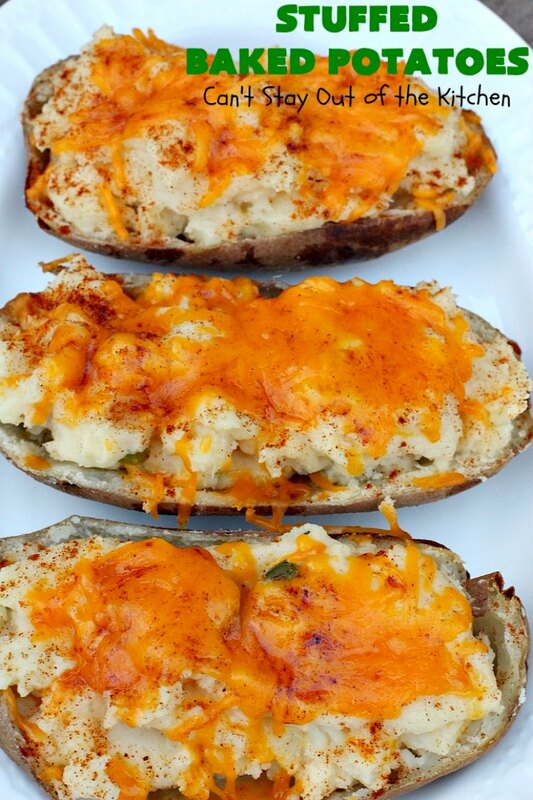 Then sprinkle each potato generously with paprika. Bake in a moderate oven (250 degrees) about 4 minutes, until cheese melts and potatoes are hot. 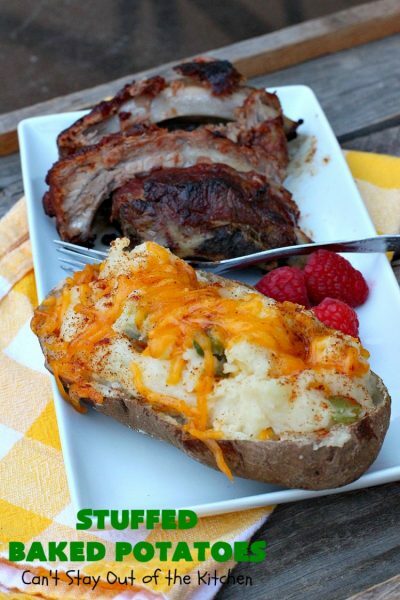 This vintage recipe is terrific served with Texas BBQ Ribs. If you enjoy Stuffed Baked Potatoes, this recipe is really delightful. Add sautéed onion and bell pepper, evaporated milk, prepared mustard, parmesan cheese and Tabasco sauce. 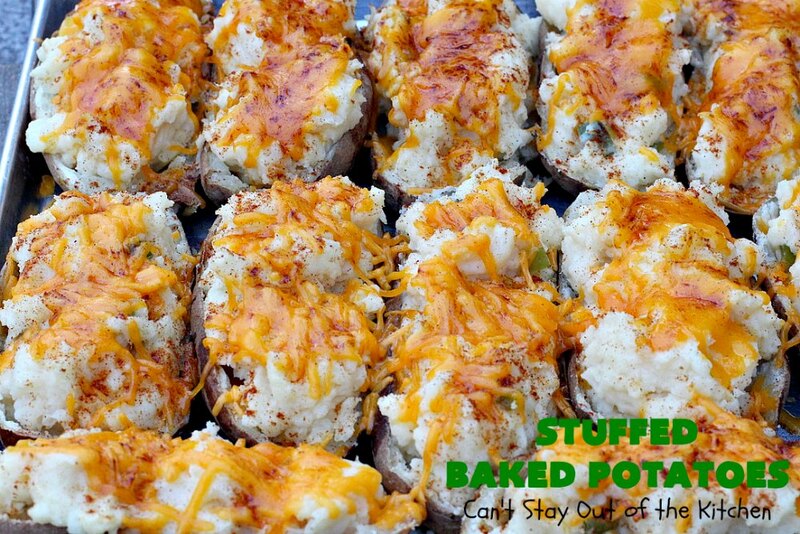 Bake Idaho potatoes until done. 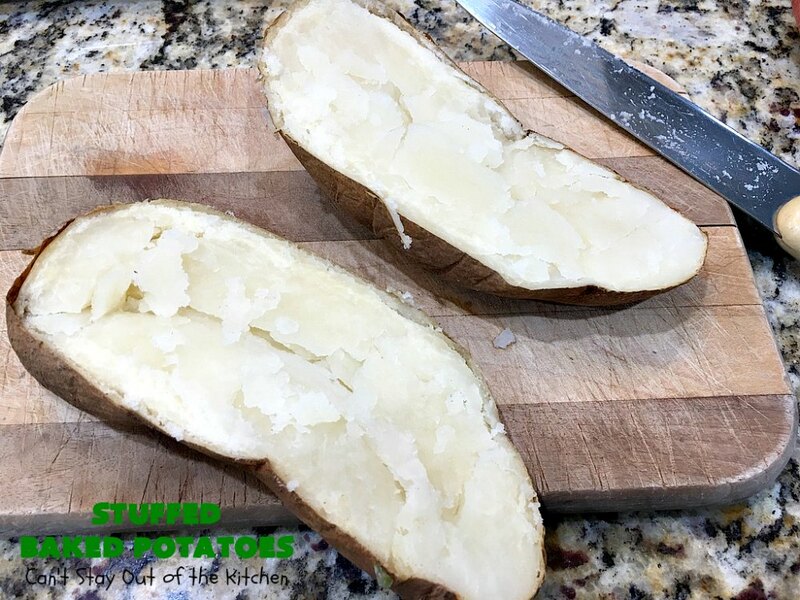 Cut in half length-ways and scoop out all of the potato except enough to make the shells stay firm. 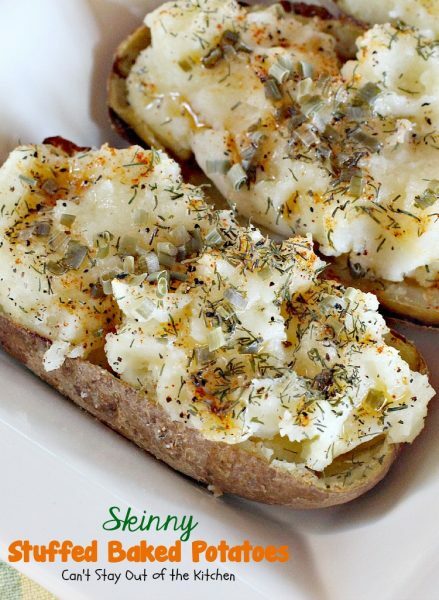 Add the scooped out portion from the baked potatoes to the Maine potato mixture and whip until smooth and semi-firm. 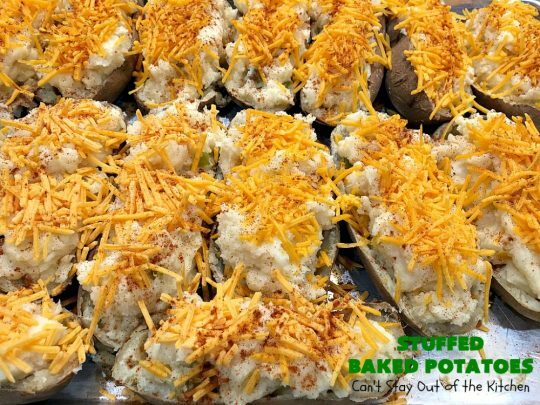 Fill potato shells so that they are mounded up to at least half an inch above top of shell. 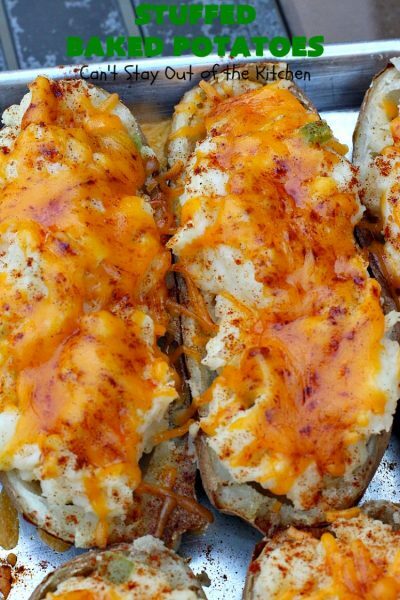 Cover generously with grated cheese and sprinkle with paprika. Bake in moderate oven (250°) for about 4 minutes. NOTE: If you want increased flavor, add more Tabasco sauce. NOTE: Check flavor of potatoes before filling potato shells. This is the time to add additional salt, pepper, Tabasco sauce or Grey Poupon mustard, if desired. 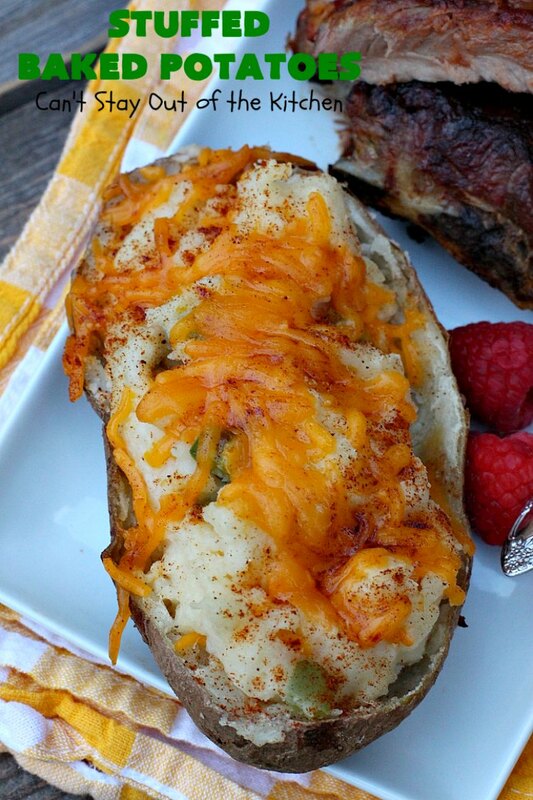 The paprika on top and the mustard and Tabasco sauce really amp up the flavors in these potatoes. While I served these potatoes with Texas BBQ Ribs, they would be the perfect accompaniment for steak or pork chops. These mouthwatering potatoes with loads of cheese really hit the spot! 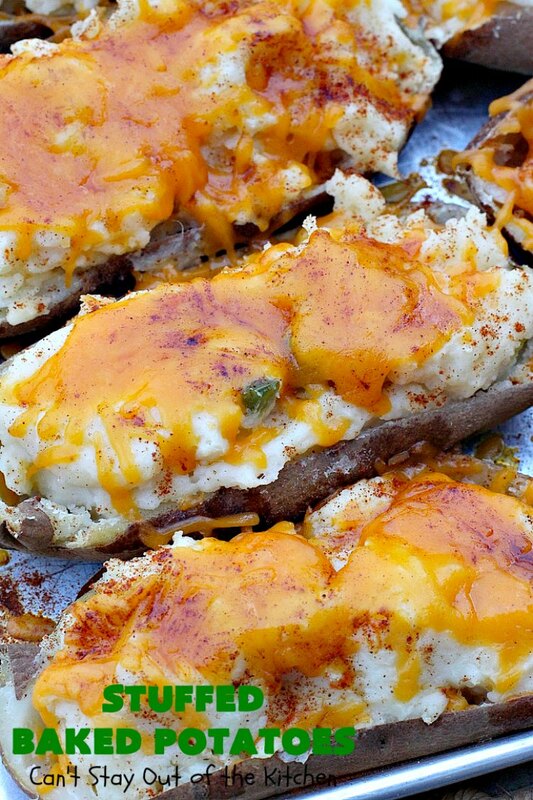 These are terrific potatoes. Enjoy.